Between recent Hurricanes Irma, Harvey, Maria, not to mention an array of hailstorms, earthquakes and fires that have plagued the non-coastal areas of the country, it’s hard to deny that the US has been under an onslaught of natural disasters. That said, it’s worth examining the economic ripples of these disasters. 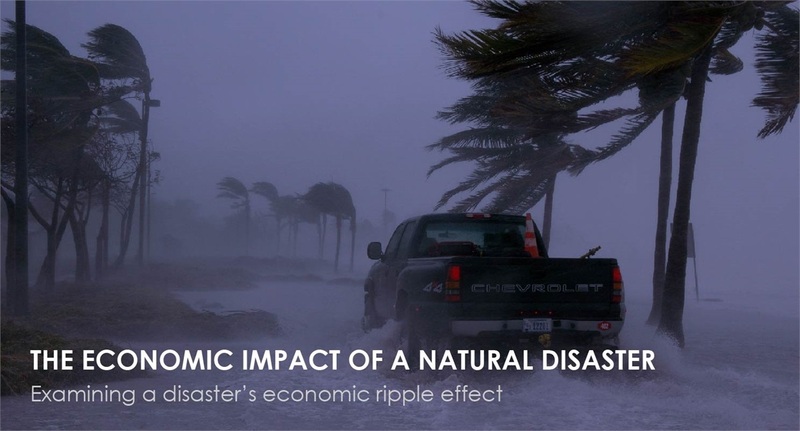 The short-term economic effects of natural disasters are evident simply by the damage done, but the final tally of economic impact can be staggering. Harvey’s final cost may be between $70 and $90 billion. The combined property damage between Harvey and Irma may cost $150 to $200 billion. Back in 2005, Katrina ended up costing $108 billion, with only $80 billion being covered by insurance. In general, on a local level, natural disasters do the most damage to infrastructure. After Maria, Puerto Rico’s infrastructure is in such bad shape, aide workers can’t use the roads or ports to get where they need to go. Maria will likely cost $30 billion in damages for Puerto Rico alone. Natural disasters also result in drastic, short-term insurance loss. Insurance companies paid out $175 billion dollars due to natural disasters in 2016. The toll is expected to be higher this year. Personal property isn’t the only sector of the local economy that natural disasters affect, as local businesses also suffer damage, loss of utilities and struggle to remain open. In the short-term, the job market tends to get hit pretty hard. The last week of August, 62,000 more Texans than average applied for jobless insurance, most likely due the the effects of Hurricane Harvey. This is the highest level of jobless insurance claims in two years. However, the job market is likely to bounce back soon, as it often does after incidents like this. Katrina was a special case, New Orleans’ nonfarm payroll is still 7% lower than pre-Katrina New Orleans even 12 years later. State GDP suffers from natural disasters as well. Puerto Rico’s damages make up ⅓ of the territories’ GDP. Local GDP is affected much more than national, with Texas’ GDP expected to grow 3.7% instead of 4.3% forecasted prior to Hurricane Harvey. Many in the US have already noticed recent natural disasters’ impact on commodities, specifically on gas prices. Harvey damaged numerous oil refineries in cities near the Gulf of Mexico such as Corpus Christi. Katrina was even worse, damaging 19% of oil production in the US. Post-Katrina, gas reached almost $5 per gallon before the government intervened. Current rises in gas prices are expected to increase inflation temporarily, but the Fed says inflation as a general trend should stay on target. Other commodities such as exports can also be affected, especially in small developing countries. However, in large, wealthy countries once rebuilding starts and infrastructure is restored, natural disasters tend not to have a lasting effect on exports as a whole. Third quarter GDP is going to take a major hit due to the combined efforts of Harvey, Irma and Maria. Florida and Texas are some of the largest economies in the US, making economists predict only a 2% GDP growth this quarter instead of the previous 2.8% growth prediction. There will be a turn in Quarter four, though. Rebuilding efforts are expected to boost these state’s economies. We know from experience that the national economy over the medium- and long-term should not be affected. Investment in ADRs and ETFs are highly affected by disasters, both at home and abroad. If you invested in any businesses near the damage, such as oil refineries in south Texas, your portfolio may have taken a hit. Industries such as transportation and construction can hit a boom after national disasters, making a potential smart investment. Right now, many car dealers near Houston are shut down, hurting investors in the short term, but there is also a much greater need now for folks to replace their cars, meaning an investment in this industry might pay off in the medium to long-run. It is easy to discuss the economic impacts of major storms and other disasters. What isn’t easy to measure is the social impact on metro areas and the lives that are turned completely upside down. Now is the time to think about your portfolio and well-being, but don’t forget the many lives that are impacted in Texas, Florida, Puerto Rico and so many other areas. One way to help others is to contribute charitably to organizations that are on the ground and making a difference in the hardest hit areas. Visit this list if you are unsure where your financial contribution may have the greatest impact. Approaching end of year, many people will need extra write-offs. Most charitable contributions will both help the victims and survivors of these natural disasters and create a tax savings for the individual investor.